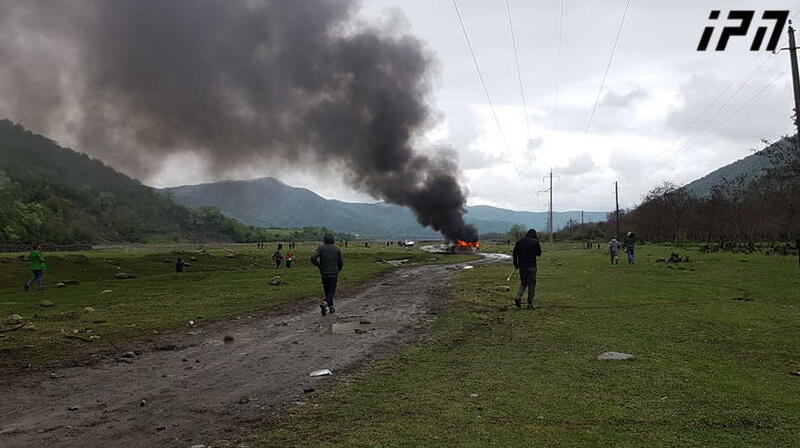 TBILISI, DFWatch–A new movement has sprung up in Georgia in response to the government forcing through a gigantic hydro power project against strong popular resistance. The movement is called Green Fist and began as a group of twenty youth who travelled to Khaishi late last summer to protest against the Khudoni dam, a mega-project that was canned by the Soviet Union due to its impact on people and the environment, but revived by former President Saakashvili and continued by the new Georgian Dream government, after a year’s procrastination. Among the demonstrators against Khudoni are a group of about twenty youth, whose symbol is a raised green fist. But despite its fighting style and symbolism, two of the members DF Watch spoke to explained that what they want is to make the government aware that there are other things that matter in life than the economy. 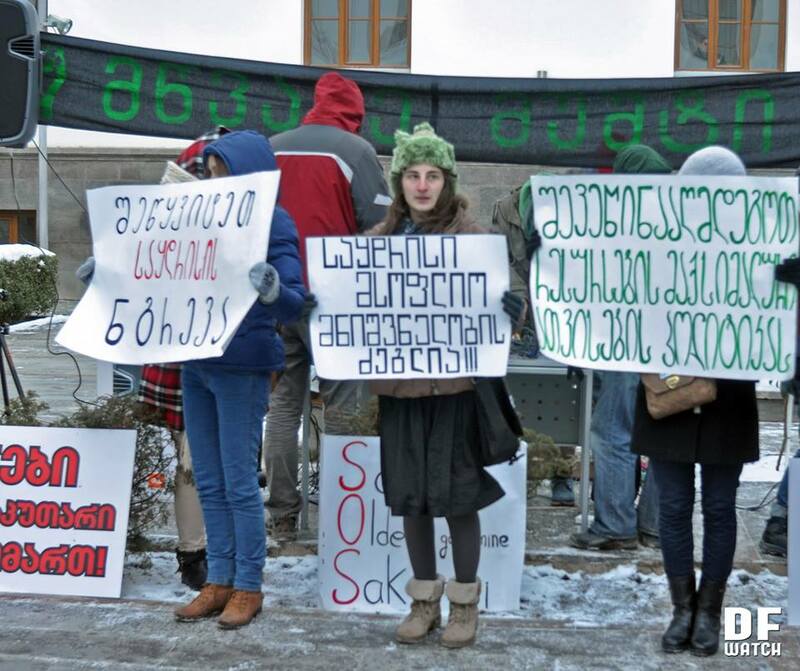 “We students are opposed to the policy which the Ministry of Economy and the Ministry of Energy are conducting now, of maximum utilization of resources,” says Mariam Gurgenidze, 23, an art historian who graduated from Tbilisi State University (TSU). She says, today, there is too much focus on the economy to the detriment of other concerns, while ecology and social aspects are just as important for life as economic development. 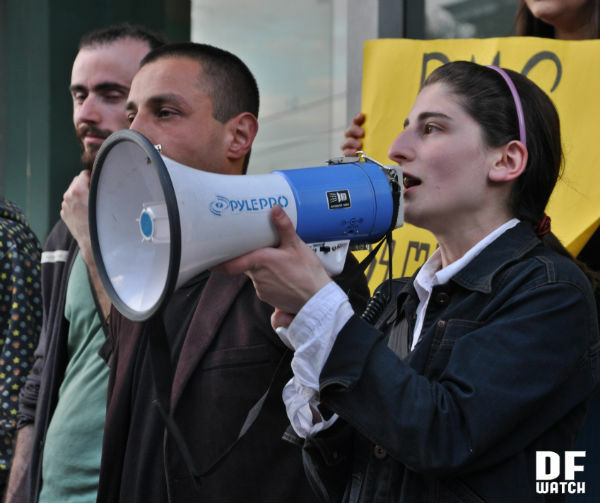 The first seed to what would become a new movement was a rally held at Deda Ena Square in Tbilisi in September 2013, to highlight the Khudoni hydro power project. The group later demonstrated outside the government office, and then went to Khaishi, in the northern Svaneti region. It was on that trip the name Green Fist came up. 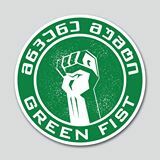 The Green Fist symbol published on the movement’s Facebook page. The fist symbol has nothing to do with the logo of the Kmara movement, the driving force behind the Rose Revolution in 2003, according to Irakli Ghutidze, 26, a graduate from TSU and freelance programmer. When semester started at university in the fall, other students joined the movement. Green Fist is not an actual organization, but a youth movement, and members finance all their activities themselves. Mariam plans to continue studying art history. She is also a member of another youth organization, Friend of Monument, which is more focused on problems in cultural heritage and culture. Irakli says he learned about Green Fist from the Internet and decided to join, even though he didn’t know anyone there, but later he discovered that some of his friends were members. The students in Green Fist cover many scientific fields: social and political studies, humanitarian faculties, architects, lawyer, archeologists and others. The movement’s organizing group consists of about 20 people and they have no office, usually gathering at TSU. All events are financed by the activists themselves. But they decided not to register the organization formally. “We don’t want it to be official like that,” Mariam explains. 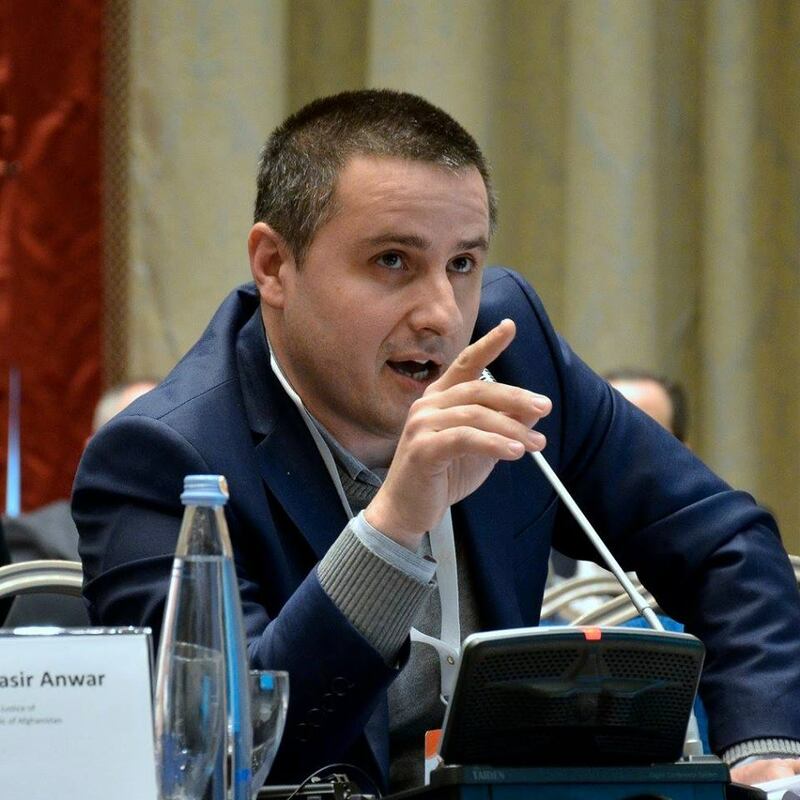 Irakli says it is hard to have one common goal among students who are completely different with different ideology, but they manage to express a coordinated position on specific problems. Many rallies have been held at the university and the culture, energy and environment ministries. There was a protest concert in minus 13 degrees C, which is unusually cold for Georgia. “It became a pretty good rally. It was encouraging. Frost doesn’t scare us,” Mariam says. 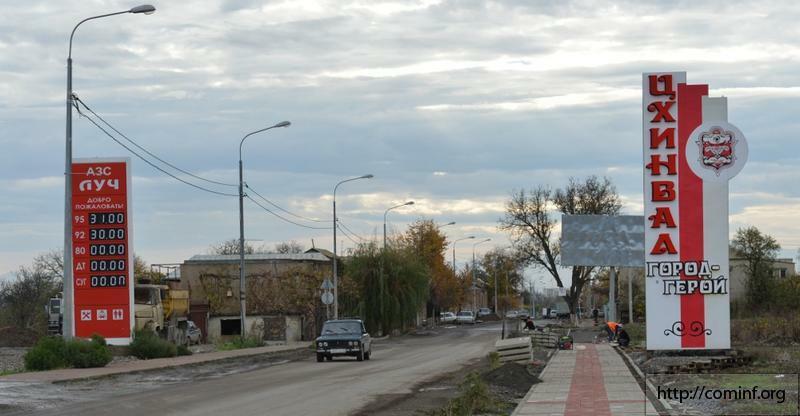 Later Green Fist joined massive rallies in Kazreti, southern Georgia, where a whole town went on strike after mining Company RMG Gold fired more than a hundred workers. Those who were fired were joined by other workers for several weeks of demonstrations demanding to give them their jobs back, improve working conditions, increase salaries and replace the management of the company. Through its rallies, Green Fist wants to show the government that people won’t accept injustice. They also want to inform other people about problems in Tbilisi, in the mountains and in other regions of Georgia. April 14, Green Fist joined a protest camp in Sakdrisi, a gold mine said to be more than 5,400 year old where RMG Gold wants to conduct mining work. The movement’s members are also making short video clips about the construction of hydroelectric dams and ecology and social problems in Kazreti. 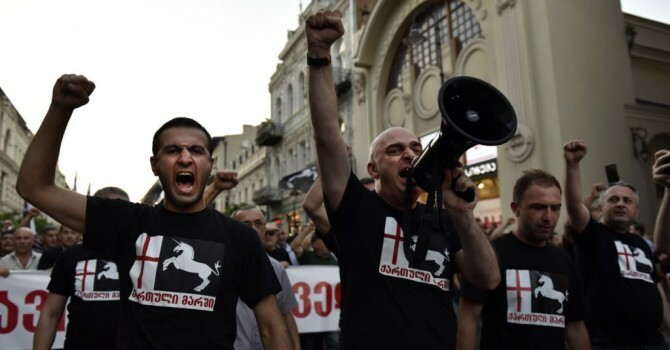 On May 1, the International Workers’ Day, they might join a rally in Tbilisi organized by other youth organizations or go to Kazreti and rally with the workers there. Green Fist tries to communicate with the government too, sending them invitations to discussions and meetings, also letters and petitions. “Usually, they ignore it or send a person who cannot even answer our questions. 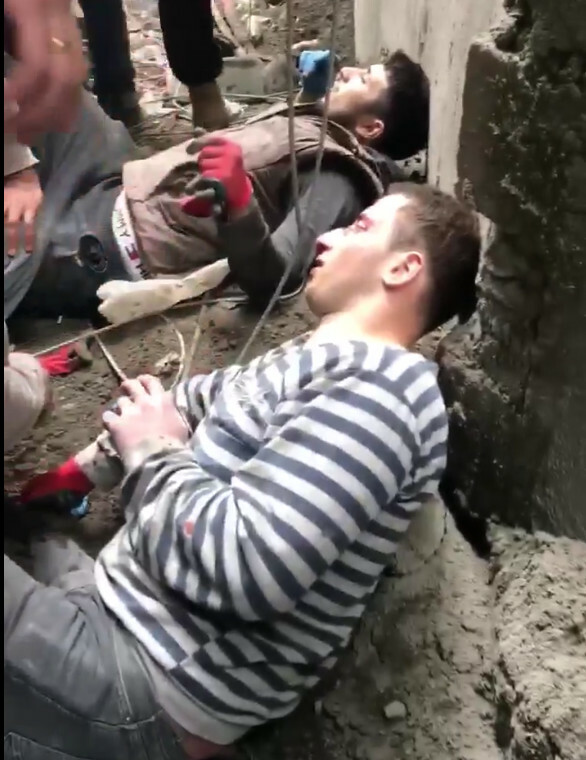 There is no point,” Mariam says, adding that recently President Giorgi Margvelashvili said he was willing to meet with them, but they still don’t know any details. Irakli says the government almost never communicates with people, and he thinks this shows what attitude it has to its citizens.